West Bengal has 37,660 sq. km flood prone area spread over 111 blocks where the total geographical area of the state is 88,752 sq. km. An analysis of the statistics of flood that occurred during last 41 years (from 1960 - 2000) shows that only on 5 occasions the state has not faced any severe flood. The total devastated area crossed 20,000 sq. km in 4 different years and the flood of medium magnitude i.e. between 2,000 to 10,000 sq. km. occurred on 10 occasions. The rivers of the districts of Uttar Dinajpur and Dakshin Dinajpur originating at Bangladesh passes through these districts and then joins the Ganga-Padma at downstream of Farakka in Bangladesh. Both the places of origin and also the outfall of most of these rivers are in Bangladesh. The district of Malda through which the river Ganga flows receives its flood water from about 11 (eleven) States and is battered by the run-off flow generated from these vast areas. Ultimately the river flows down the Farakka Barrage to Bangladesh. Another portion of the Malda district receives floodwaters of the Mahananda, which again originates in the hills of the neighbouring country of Nepal and has some catchment area in the neighbouring state of Bihar and then passes through the district to join the Ganga-Padma at downstream of Farakka Barrage in Bangladesh. Major contributing factors to flood in North Bengal regions are the run-off because of heavy local rainfall, discharge of upper basin areas and also outfall condition in the neighbouring countries. The Mahananda and most of the rivers of Uttar and Dakshin Dinajpur districts get stagnated when the Ganga upstream and downstream of Farakka Barrage rules high thereby not allowing drainage of flood discharge during that period. In other sub-basin areas of the Bhagirathi-Hooghly there are certain distinctive features of drainage condition which give rise to flood situation. Basin-wise there are quite a number of rivers on the West bank of the Bhagirathi-Hooghly, these are Pagla-Bansloi, the Dwarka-Bramhani, the Mayurakshi-Babla-Uttarasan, the Bakreswar-Kuye and also the Ajoy. These rivers between them drain an area of 17,684 sq. km, spread over the state of Jharkhand (the old Bihar Plateau), and districts of Birbhum, part of Murshidabad (west of Bhagirathi) and Burdwan. They generate flood because of high rainfall in these basins and limited carrying capacity of the river Bhagirathi between the towns of Jangipur to Kalna. In this reach the Bhagirathi has discharge carrying capacity of maximum 1.1 lakh cusec. All these rivers if receive rainfall simultaneously in their catchment areas can generate run-off volume of any amount between 4 to 6 lakh cusecs at their outfall at the Bhagirathi, as it occurred during the flood of September 2000. In this vast tract of land there is one structure which interferes with the natural flow of flood water i.e. 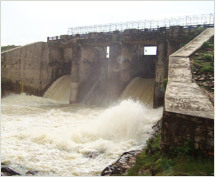 the Massanjore Dam. 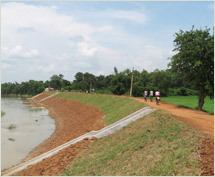 This dam, constructed for irrigation, intercepts about 36.4% of the Sidheswari-NoonBeel-Mayurakshi basin area of 5109 sq. km. It can discharge / generate only 16% of run-off that is likely to be generated in case of simultaneous rainfall in these basins, west of the Bhagirathi, from the Pagla-Bansloi to the Ajoy (including catchment of Ajoy). The flood in this zone becomes voluminous because of the shape of the catchment area, its steep slope starting from a high level plateau area and sloping sharply down to a flat terrain near the outfall of limited capacity. This feature is again adversely affected by tidal condition as is generally noticed in the month of September, the likely month of occurrence of flood. As it happens, the contribution of dam discharge to the total flood volume is not much. 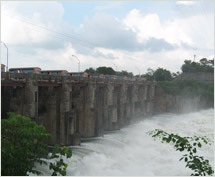 The Massenjore Dam cannot control any flood. On the left bank of the Bhagirathi river system the Bhairab-Jalangi-Sealmari group of rivers originate from Ganga-Padma at Akherigunj in Murshidabad district and meet the Bhagirathi at Swarupgunj in Nadia District. This system of rivers between them drain a total area of 4,300 sq. km of Murshidabad and Nadia districts. Generally this area suffers from flood because of three reasons – (1) high intensity rainfall in the basin area itself, (2) inflow of flood water from Ganga-Padma at its high spate and (3) drainage congestion at its outfall because of high stage of the Bhagirathi. In the Damodar-Barakar Basin System, the rivers originate at Chotonagpur plateau and flows down the planes of West Bengal to meet the Bhagirathi. 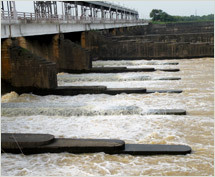 The catchment area upto Durgapur Barrage is 18,026 sq. km as against total catchment of 22,015 sq. km. In this catchment area there are only 4 (four) reservoirs having a storage capacity of 1.21 lakh ha.m. 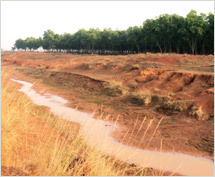 The original concept of flood storage was to have an area reserved for storing a volume of 3.58 lakh ha.m. Thus with this limited flood storage capacity the storage dams at present can modify only the peak flood discharge. Any discharge above 70,000 cusecs down stream of Durgapur Barrage may cause flood depending on the outfall condition of the Mundeswari at Harinkhola. In the Kangsabati River System which also meets the Hooghly, the total basin area is 8,369 sq. km and it has 3,625 sq. km at the upstream of the Kangsabati dam. The dam has a limited flood storage capacity of 29,170 ha.m. which is very nominal. In this basin spillway discharge from Kangsabati dam above 50,000 cusecs may cause flood at lower reaches downstream of Midnapur Town (anicut at Mohanpur) depending on tide and downstream rainfall. The Mathabhanga-Churni-Ichamati System of rivers originate at the Mathabhanga off-taking from Ganga-Padma downstream of Farakka Barrage in Bangladesh and on reaching West Bengal at Majhdia, in Nadia district, bifurcates in two branches – (1) the Churni flowing on South-Westerly direction meeting the Bhagirathi at Ranaghat and (2) the other branch viz. 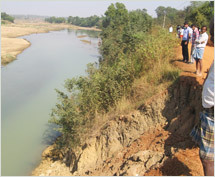 the Ichamati flowing on South-Easterly direction to meet Bay of Bengal through the creek of Raimangal. The main flood situation in this area arises because of inflow from Ganga-Padma (when it rules high), rainfall in the own catchment area and also tide lockage. In flood 2000 a very unusual situation arose where the Bhagirathi transferred a large volume of its floodwater to this basin area by breaching its embankments at several places. In view of its geographical location at the tail end of the Ganga Basin and several other Himalayan rivers, the problem of flood management and drainage in the State is quite acute. Several committees have examined the problem and suggested the remedial measures at different times. These are being implemented in stages since the year 1954. The measures generally implemented are the embankments and river training works, improvement of drainage systems, providing flood storage in reservoirs, construction of multi-purpose reservoirs etc. The State had taken measures mentioned above which resulted in providing a reasonable degree of protection to an area of 2.077 m.ha. out of a total flood prone area of 3.816 m.ha. the important storage projects which are giving benefits by virtue of flood storage specifically provided in the dams, are the D.V.C. system of reservoirs and in a limited way the Kangshabati reservoir. The flood storage is not fully available for moderation as the acquisition of land between the FRL & MWL in the Panchet and Maithon Reservoirs of the DVC system has not been made due to various factors. A committee was set up to examine this aspect and it submitted its report. Inspite of this lacuna, the flood cushion available in the two reservoirs has helped in reducing the effect of flood intensity in the lower reaches in most of the years in the past.